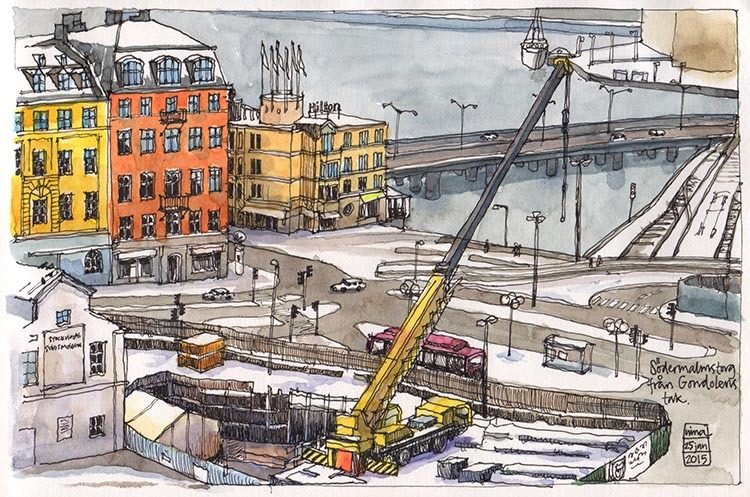 The Stockholm sketching group met last Sunday to sketch the view from a cozy rooftop bar at Södermalm. Only the bar was closed, so we ended up outdoors on the roof of restaurant Gondolen instead - cold, but with a view over my fav spot to draw, Slussen. The New Slussen project is already visible everywhere around this place, although the city hasn´t officially started the actual destruction of the old Slussen. There are big roadworks preparing for the destruction, huge holes, fences and central heating pipes just about everywhere. It´s getting harder to walk or bicycle past Slussen, there is always a new concrete barrier somewhere forcing you out of your normal ways.